What I propose is that we can create complete independent multiple “Internets” with each Internet having its own IP-address space, Domain namespace and an authority to manage Domain names. And these networks/Internets can be entirely IPv4 only based or IPv6 only based. Currently we have only a choice to choose the ISP and by subscribing to their service we get access to single Internet. But with multiple Internets we can have subscriptions to one or multiple Internets just like TV channels as shown below. We have currently Internet which is a global WWW. But we can have country specific Internet, community specific Internet, area specific Internet, and so on as shown below with multi-dimensional Internets. So if it is a small community driven Internet it is nothing but an Intranet (sort of). In this case we may no longer need large ISPs. Instead this network can be built and managed entirely by community with public/community funded networking equipment. Unlike existing Internet. Country specific Internet can have a complete Internet infrastructure heavily regulated by local country specific laws. This may help in few situations such as tackling issues like pronography, violence, drugs, etc which a specific country may wish to ban/censor all together. This is not possible with existing scenario. Internet is so vast banning outright any content is simply not always feasible. Sometimes this also means safe Internet for schools, children and family. Case 1: Spanning Domain names across Internets this way. But is this legal ? Case 2: Phishing, security and authenticity ? Case 3: Possibility of Inter-connectivity (some kind of bridging, etc) ? 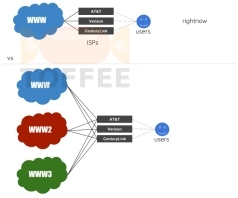 So that users connected to WWW can reach WWW2, WWW3 and so on. Note: Bridging I mean not L2-bridging. What I mean here is chances/feasibility of Internet Inter-connectivity. I got this idea in the year 2014 when I was exploring about CubeSats (and such Satellite Network via Raspberry Pi soon after I purchased my first Raspberry Pi2). Satellite networks are networks of networks. Unlike land based networks Satellite Networks have no such restrictions. And I was also partially inspired by Google Loon project. Eventually it struck me that why we need to limit ourselves with just one Interent (or WWW) ? Why cannot we have multiple individual (and so multi-dimensional) WWWs ? So I was confused how to share this view globally. Initially shared with few of my high-profile contacts who are into Internet services, Network Infrastructure domain, etc. But eventually it turned out either they are not interested, or a case that they are unable to imagine the magnitude of change this can cause globally. Hope you guys got some big picture. I am still in the process of writing this proposal. If you have any ideas or suggestions you can kindly put forward.